Plants add that spark of magic to a space. We’re all loving white walls, minimal furniture and lots of plants. Some are calling it the #jungalow style. 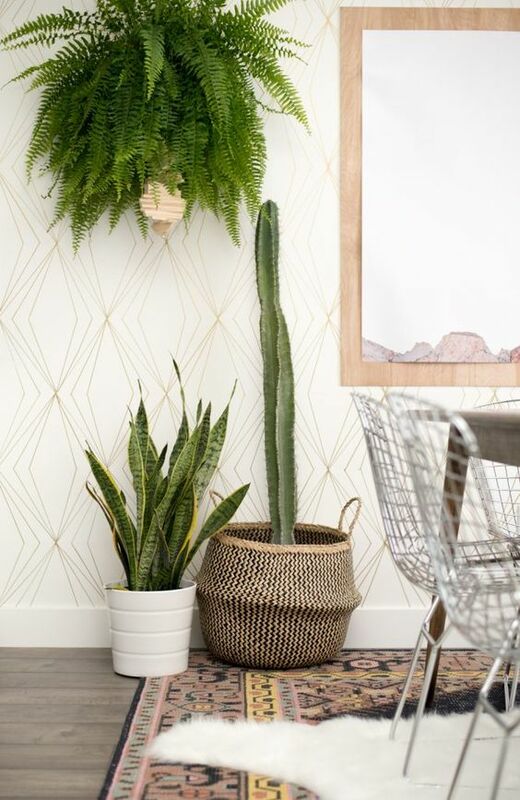 Though filling up our modern homes with plants may seem like the latest bohemian decor trend, it’s actually something we’ve been doing since the beginning of time! Living among plants is grounding, inspiring and taking care of them can be a chance to practice mindfulness. The toxic chemical, formaldehyde is found in so many house hold products, such as our mattresses, sofas and clothing! Bamboo is magical, it can help get rid of chemicals like formaldehyde! This tropical plant thrives in shady spaces and is super easy to keep alive with minimal watering. Growing up to 8ft high, the bamboo palm is not only a natural cleaning solution to keep you healthy, but a giant friend! Plants are truly amazing. They’re like our ancient grandparents protecting us as angels on earth. I mean the Boston Fern literally protects us! It removes toxic metals such as mercury and arsenic from the air. It makes since that the Boston Fern is a common household plant! According to researchers at Kansas State University, adding plants to hospital rooms improved recovery rates in surgical patients. Not only can this plant absorb carbon monoxide but it’s also edible and high in magnesium, vitamin c, protein and calcium! It has been known to decrease symptoms of the flu, sore throats or chronic headaches. Elegant in beauty, powerful in cleaning air. The peace lily filters toxic chemicals and absorbs alcohol and acetone which is emitted from household electronics and cleaning products. Needing more light than the rest of the plants on the list, this beauty deserves a spot right in your kitchen window! INTERESTING FACT: Plants produce negative ions, which attach themselves to (and effectively remove) particles such as dust, mold spores, bacteria, and allergens. Negative ions also have a profound calming effect – think crashing waves or blissful rainstorms. There are so many plants to choose from! Share some of your favorites in the comments below! I like this post–your blog design is very pretty! #3 looks more like a snake plant than a spider plant. Isn’t a spider plant the one that you put in a hanging basket and offshoots tiny “baby” plants? Thank you so much for your comment! I uploaded the wrong photo but I switched it. Appreciate your time on letting me know! Oh my Lexi! You are right 🙂 I changed it. Looks like I uploaded the wrong photo ahh!